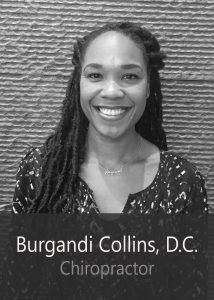 Dr. Burgandi Collins is a licensed, board certified chiropractor in the state of Virginia. She earned her Doctorate of Chiropractic degree from Life University and obtained a Bachelor’s of Science degree from Old Dominion University. Dr. Collins began her professional career as a radio broadcaster but after being involved in a car accident, she was inspired to change careers and become a chiropractor. Dr. Collins really enjoys being a chiropractor. As a chiropractor, she is able to help many people heal and live healthier lives. She uses precise chiropractic adjustments, physiotherapy modalities, and corrective exercise to help patients heal and feel better. She caters treatment to each patient’s individual needs and tailors her adjusting style to their individual comfort level. She empowers her patients with knowledge so that even after their primary conditions are resolved, they can continue to live with optimum health. In addition to treating patients, she enjoys traveling, spending time outdoors and spending time with her family. She is a yoga lover and enjoys running, biking and reading. Dr. Collins is certified in Activator technique and proficient in full spine and extremity adjusting and soft tissue work. She is very happy to meet you! Dr. Collins provides chiropractic services to our patients at the Clarendon and Courthouse offices.